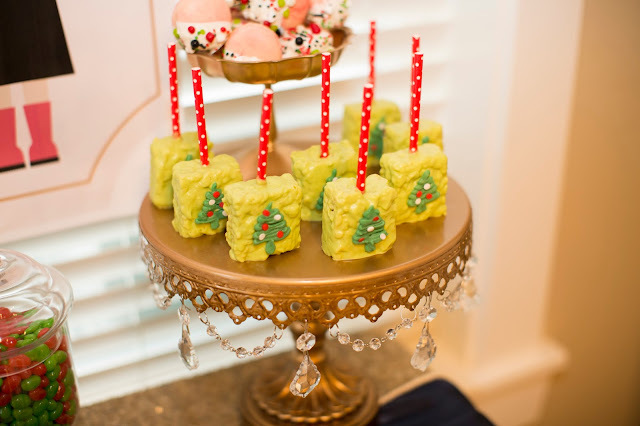 I'm happy to be sharing another great party from 4 Kids Cakes. . I adore this party because it's nutcracker themed and I've always loved nutcrackers. I have several staring at me right now from my mantle as I type this post. When my husband and I went to Leavenworth, Washington the nutcracker museum was a must! I spent a good chunk of the afternoon in there looking over all the old and new nutcrackers in their collection. 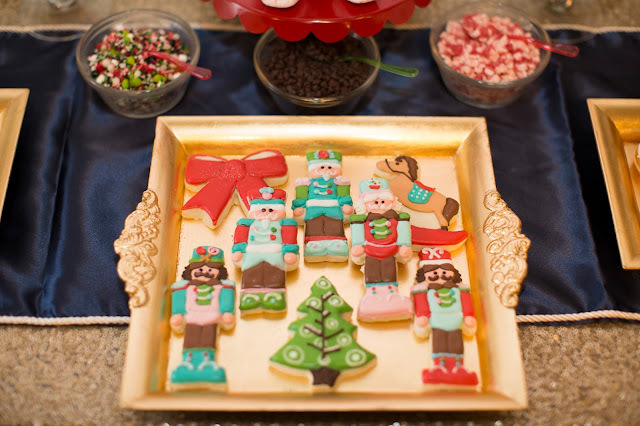 Christina of 4 Kids Cakes kicked off the nutcracker theme by making them front and center on the mantle. I like how she used various versions of them. 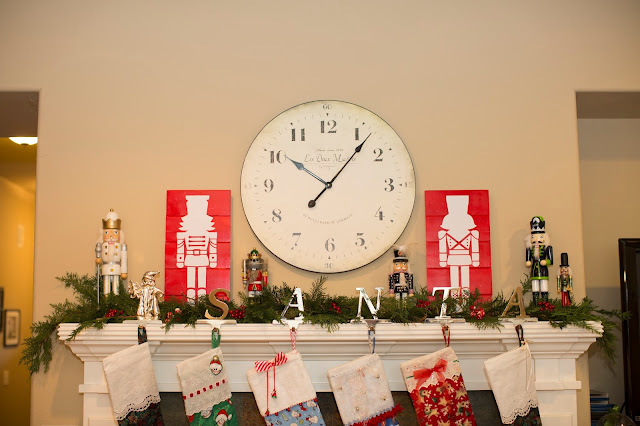 The giant silhouette's that flank the clock, the traditional looking nutcrackers and the cute little peg nutcrackers. Lets take a closer look at the peg dolls. 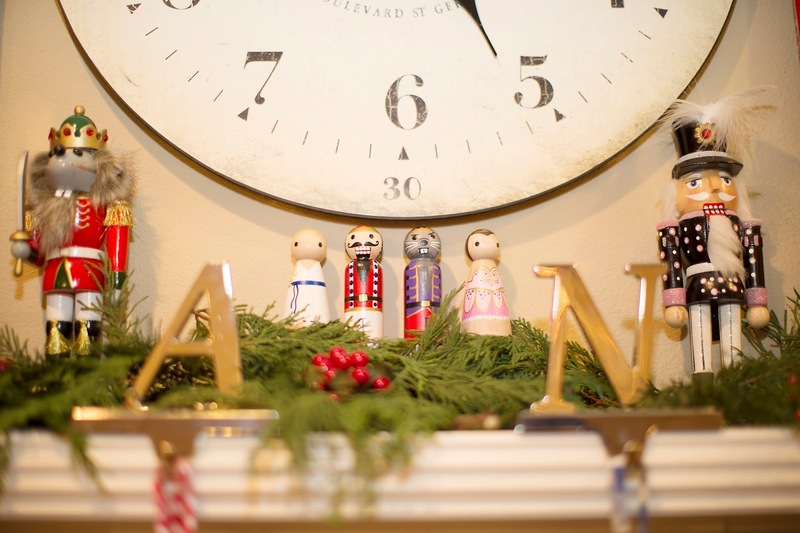 How cute are these peg dolls that represent the Nutcracker ballet. All hand painted by Peg Buddies. You could use these as decor, to top cakes and more. Now this is my kind of hot cocoa bar. So many choices. Marshmallows, peppermint candies, whipped cream, sprinkles and more. There's something for everyone's tastes but it's not overwhelming. Christina did a great job of offering a lot of variety without over crowding the bar. I'd totally be grabbing one of those nutcracker water bottles. So fun! 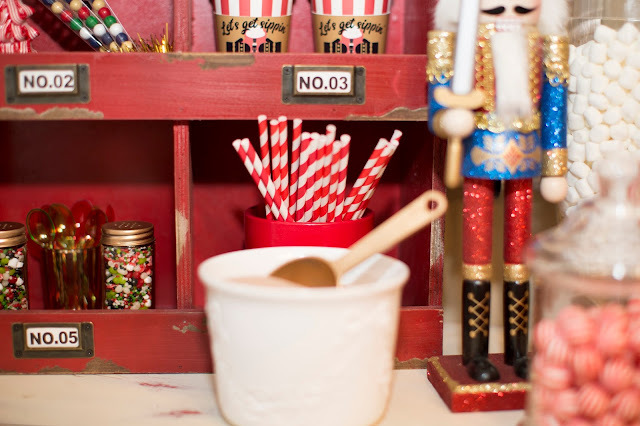 I'm all over that glittery nutcracker. He's so fun and ready to party!! 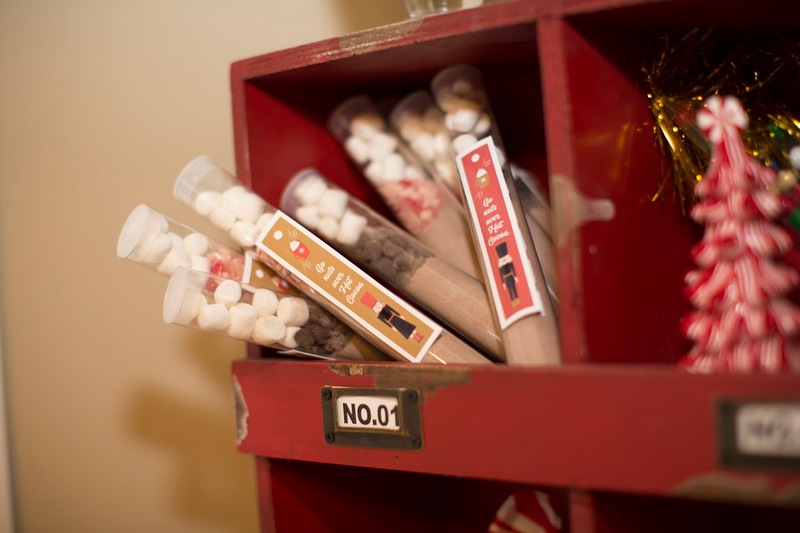 Send guests home with hot cocoa party favors. Easy to make and a welcome treat on a cold day. They make great stocking stuffers too. 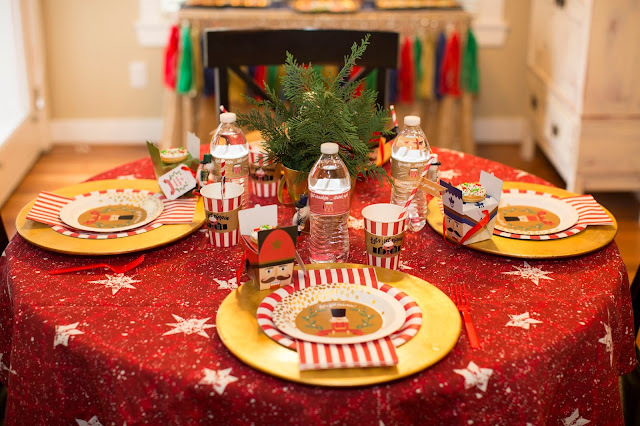 Setting an on theme table doesn't mean you have to go out and buy all new dishes that you don't have room to store. You can get a great party look with paper products and more easily tie the theme all together. Gold chargers are a party staple if you throw a lot of parties. You can use them for so many themes and they elevate the look of paper products. Adding fresh greens for the centerpiece brings in the scents of the season. Christina achieved a high end look to her table by layering. 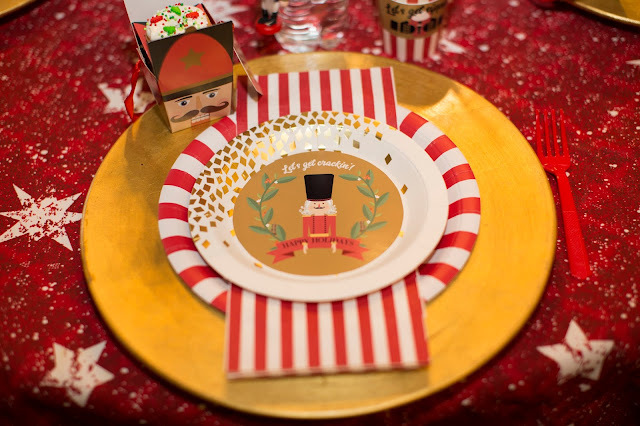 The gold charger sets the base and by mixing the red and white stripped plates with the confetti nutcracker plates and sandwiching the stripped napkin in the middle, a lux look is achieved. 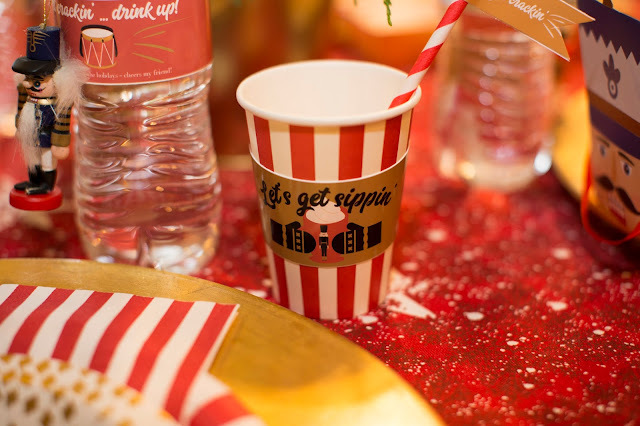 I'm all about the little details of a party like the nutcracker ornament attached to the water bottle and the printables made just for this party with cute sayings. 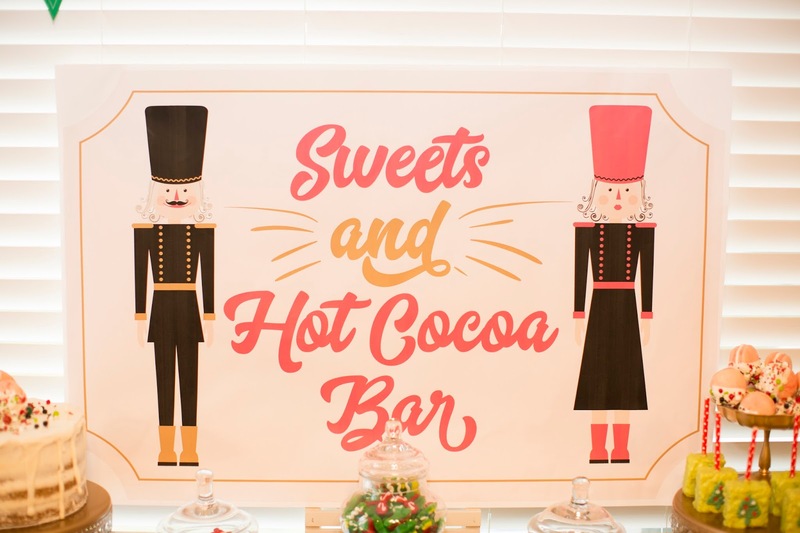 Printables are a great way to customize your party. 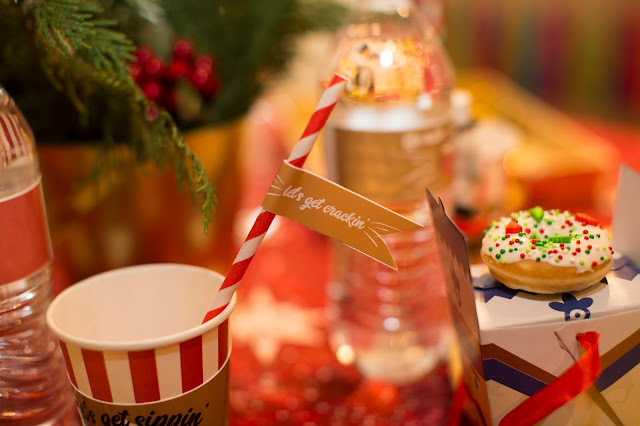 Colourful mini donuts atop the nutcracker boxes are so festive and would make great party favors too. A tasty after party snack or breakfast the morning after the party. 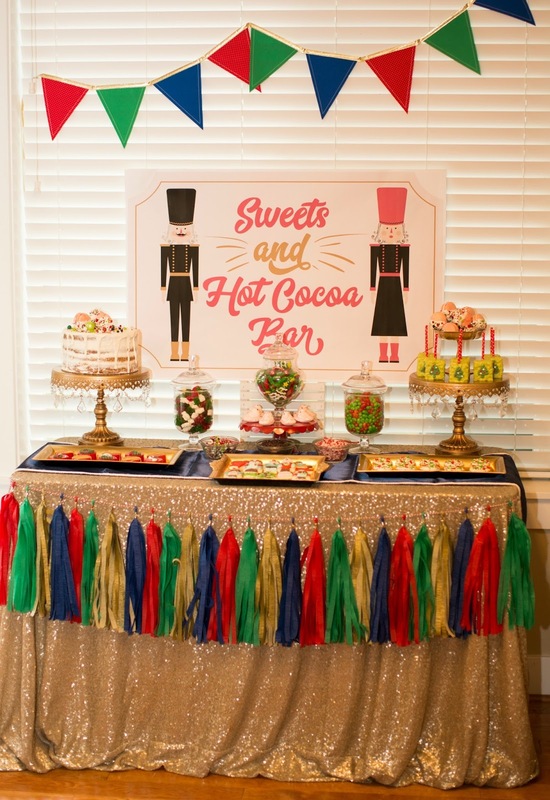 Now, lets check out this dessert table dressed in all it's finery just like when you attend a ballet. 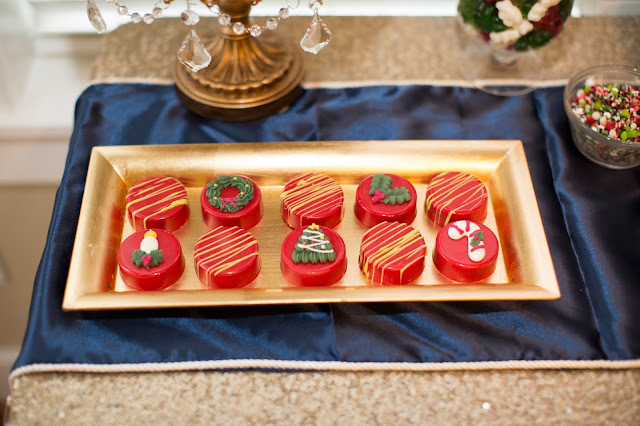 Traditional Christmas colours of red, green and gold are given a fresh look with touches of navy. Lets take a closer look and load up our plates with some delicious treats. Having signs custom made for the backdrop are actually an inexpensive way to take up a lot of real estate. You can either have your local printer attach the printable sign to foam core or you can do it yourself. I've also attached printable backdrops to canvas. 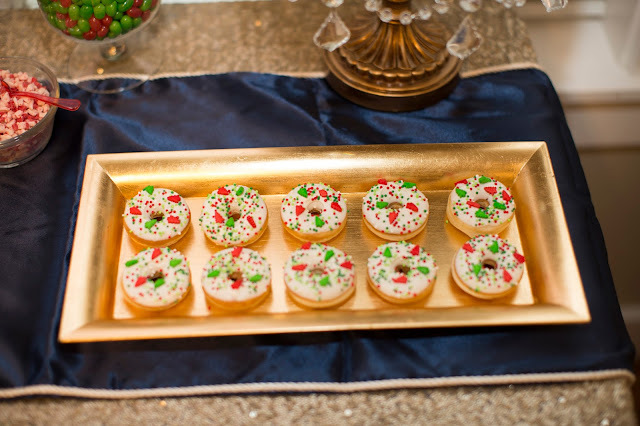 Chocolate covered Oreos made by 4 Kids Cakes really pop against the gold tray. I really like the look of the gold against the navy too. These mini donuts looks so good! I really like mini desserts. They're the perfect bite size allowing you to sample more of the treats on the table. 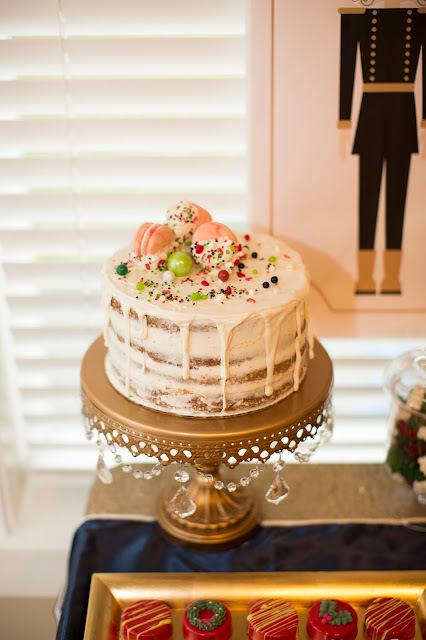 Oh my goodness, look at that cake! Don't you just want to cut a big 'ol slice. I would definitely want a slice with a macaron. I have found that kids aren't the only ones who like Rice Krispy treats. Whenever I've made them for my parties the adults love them. It takes them back to their childhood. 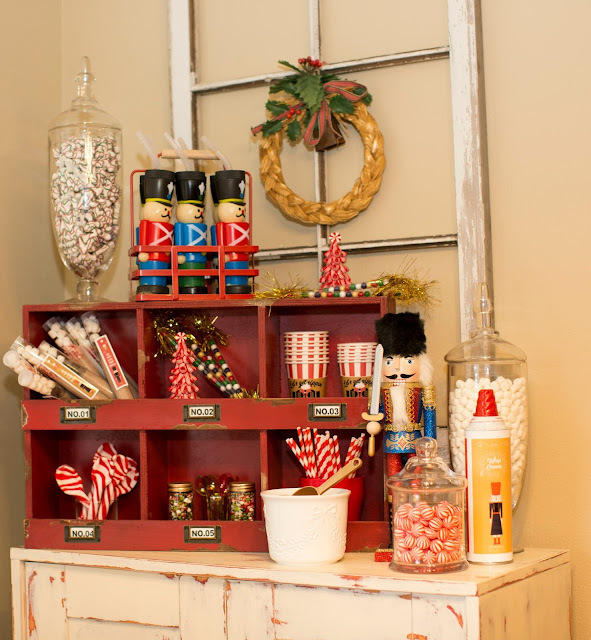 I spy jelly beans, my fav! and more macarons. I don't know about you but my plate is getting full. I want to try one of each. 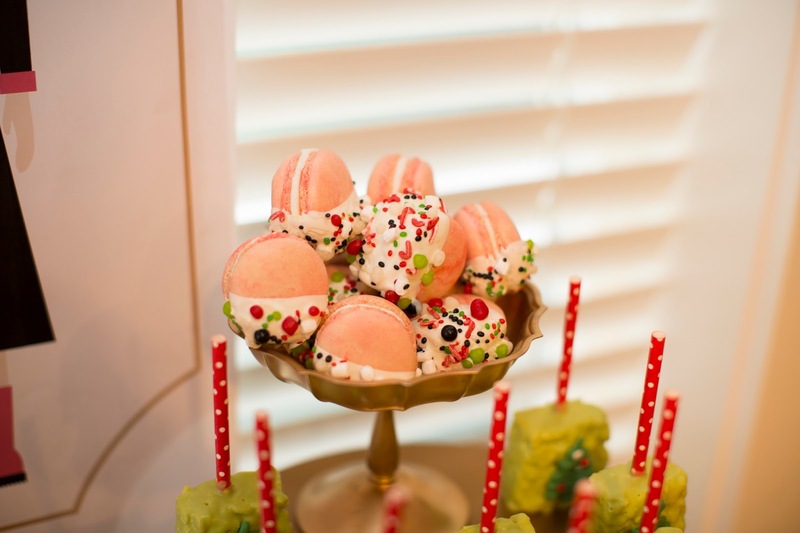 Frosted and sprinkled macarons! I'm in sugar heaven! !